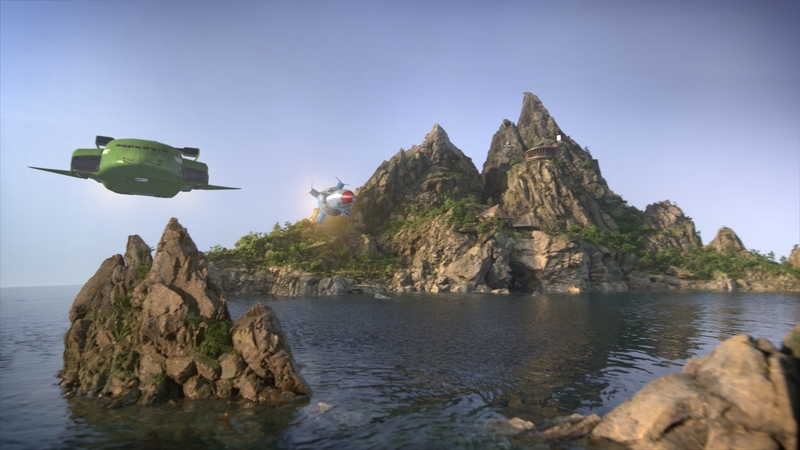 Milk was hired by ITV Studios as the creative and collaborative VFX production hub for their re-invention of Thunderbirds – Thunderbirds Are Go. The 26 x 30’ series premiered on UK television in April 2015. Working in close collaboration with ITV Studios, Milk has established a seamless international visual effects workflow to bring together Weta Workshop’s live-action miniatures and Pukeko Pictures’ post-vis plates and the CGI characters and vehicles. 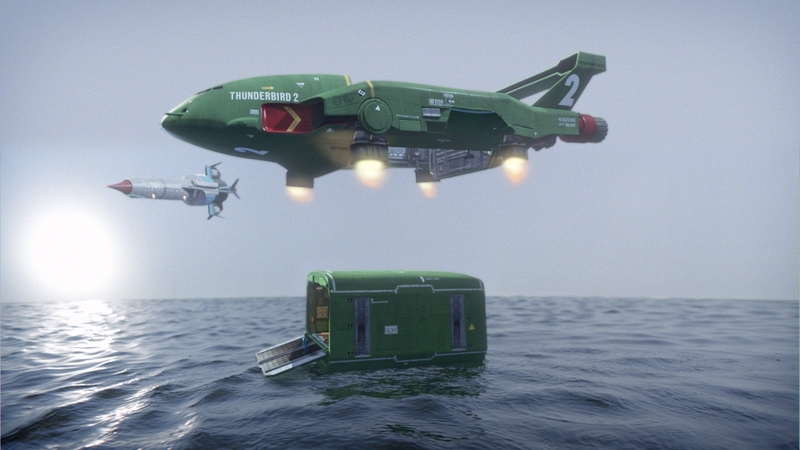 In order to manage approximately 400 shots per episode, for a 26 episode series, over an 18-month period, Milk created a bespoke pipeline for every Thunderbirds Are Go shot to composite each shot together and create and apply the signature finished 3D look with 2D effects. Even live-action plates with no CG are given treatment by Milk to ensure complete continuity of style throughout. 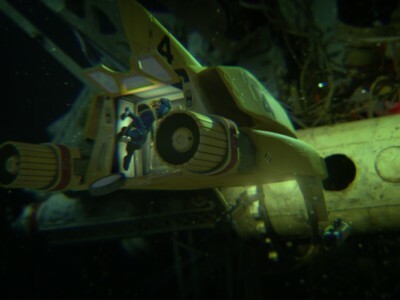 Milk’s brief includes the look development, creation and enhancement of key environments integral to the story including underwater, space and storm scenes. Milk also created lighting for the CG Thunderbirds vehicles. The Milk team, lead by VFX Supervisor Sara Bennett and 2D Supervisor Ellie Sutton, have been working closely with Series Director David Scott to find creative solutions to achieve the iconic look of the new series in every shot – to bring a filmic feel with heavy grain and shallow depth of field. Milk’s brief was to create the illusion that the CG is indistinguishable from live action; keeping a strong visual link to the past but imparting a digital feel. 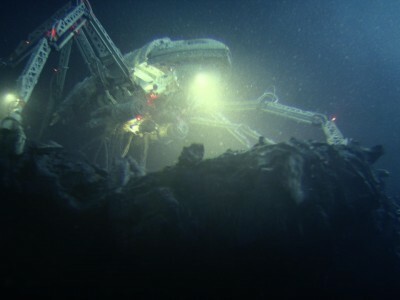 The key was ensuring a filmic look and losing the clean look of the CG. 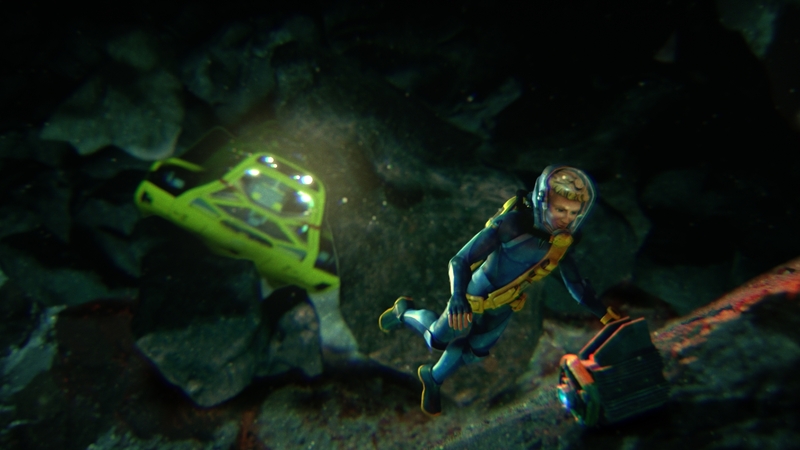 Underwater – Milk created the look development for all underwater sequences in the series of which there are two major ones. 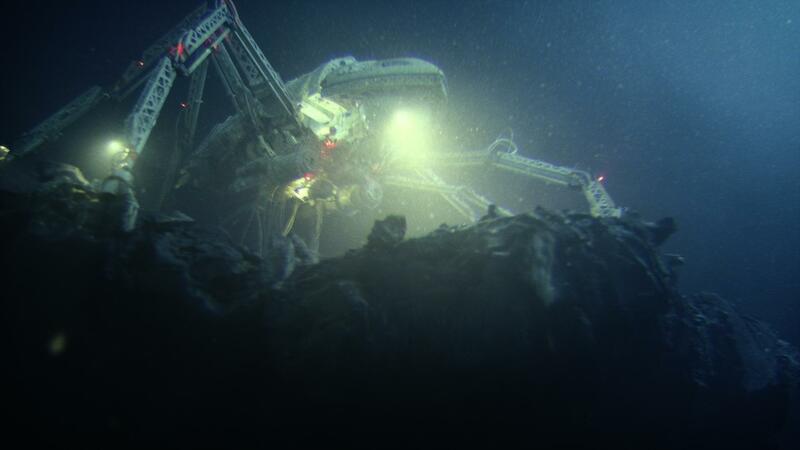 In order to give movement, life and a realistic feel to the underwater environments Milk used Nuke Particle System – adding crud, which was built up in layers with different levels of focus. Fogging effects were also added using depth mattes to add haze and density. Heavy filters were added including chromatics and distortion effects to help sell the illusion of being underwater. Storms – Milk createdthelook development and effects for a spectacular storm sequence in the debut episode when Thunderbird 2 rescues two people from a hot air balloon. The team used a mix of elements to achieve this: Working closely with David Scott, Milk incorporated an element shoot including smoke elements for the storm effects and blended these with their own in-house elements. Another storm sequence in a later episode features a hurricane viewed from space, which required a digital matte painting to create the eye of the storm as a base layer onto which Milk applied the same technique of layering up smoke elements. Holograms – Milk also worked with David to develop and create a contemporary look for each of the Tracy family’s pop-up communication holograms, used in every episode. Milk worked with the original Thunderbirds look adding a digital feel. Set enhancements- The live-action miniature sets were enhancedat key stages throughout each episode using DMP and 2D effects, to create depth and scale and ensure they were perfectly in keeping with the style of the new series. For example, in episode 5, Milk extended the runway and desert as well as opening up the mountain range of the built set to add distance and scale.Milk also created a digital matte painting of a desert for the scene in episode 2 in which Kayo parachutes in to confront The Hood. This was key to making Kayo’s parachute descent look realistic and in keeping with the aesthetic of the series. Skies – Milk enhanced the skies in every episode. The team projected digital matte painting skies onto a sphere in Nuke, which they use in most exterior shots. They also projected clouds onto cards to add movement and depth to shots. Wispy clouds were frequently added to enhance sequences featuring aircraft or the airborne Thunderbirds vehicles. Several episodes are set in space, which required Milk to create a ‘Gravity’ style feel. Milk used a NASA reference map to ensure the stars and space looked realistic. Thunderbird vehicles – Milk created the look development for each Thunderbird vehicles’ thrusters – each of which has a different look and style. Milk used a mix of shot elements and in house library elements for these. WHICH WERE THE MOST COMPLEX SEQUENCES? The challenge was creating environments that worked effectively using 2D elements that still give a 3D feel with depth and scale while looking spectacular. 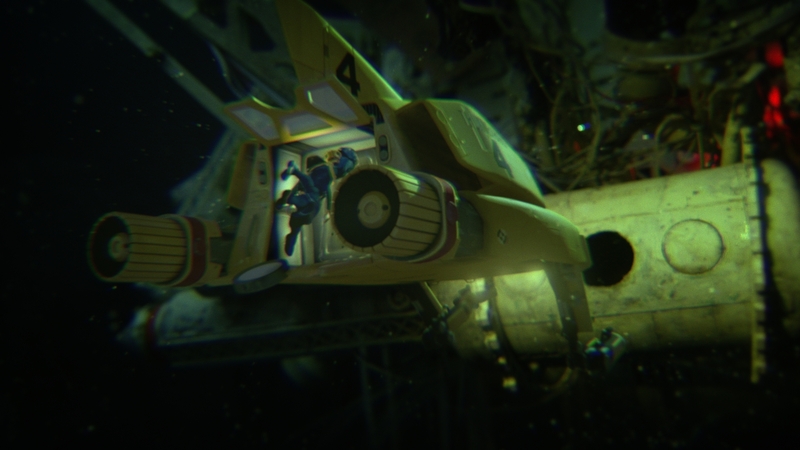 For the underwater sequences Milk created layers of crud using Nuke’s particle system. This gave a lot of flexibility and control, enabling the team to add variations in terms of speed, scale and density to different scenes shot in the same key environments. In addition filters and chromatics depth hazing were applied in order to really sell the feeling of being underwater. The Milk team, lead by Sara Bennett has had an open dialogue with the series and episodic directors the production and editorial teams (based at ITV Studios in London and Pukeko Pictures in Wellington) to ensure that the whole process was smooth and efficient and creatively achieved David’s iconic vision for the new series. The project’s workflow logistics was the biggest challenge of the project, particularly given the sheer volume of the work with 400 shots per episode and 26 episodes! With multiple production partners across the world creating key elements of the series there were many factors/elements that needed streamlining. Milk’s challenge was to unify each partner’s workflow while working to a tight schedule and budget. Milk and ITV Studios worked together to co-ordinate delivery timing and deadlines incorporating regimented feedback and continuity – across multiple time zones. Milk’s Thunderbirds Are Go VFX Hub is run by Line Producer Liam Tully in co-ordination with ITV Studios. The project was run using Autodesk’s Shotgun – essential to ensure continuity of data moving between four countries. Milk was instrumental in setting up the production workflow, working very closely with ITV Studios’ Teresa Reed. Nuke; Autodesk Shotgun; Photoshop; Maya for lighting; Particle plug-in adapted by Milk for Thunderbirds.